National Bankshares, Inc. (NKSH) operates as the bank holding company for the National Bank of Blacksburg, which provides a range of retail and commercial banking services to individuals, businesses, non-profits, and local governments in Virginia. This dividend achiever has increased dividends on its common stock for 12 years in a row. 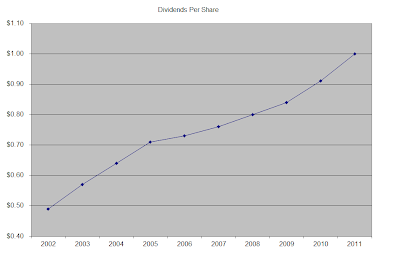 The company’s last dividend increase was in May 2012 when the Board of Directors approved a 16.70% increase to 53 cents/share.I uncovered this hidden dividend star in my weekly review of dividend increases. Over the past decade this dividend growth stock has delivered an annualized total return of 12.30% to its shareholders. The company has managed to deliver 6.60% in annual EPS growth since 2002. Analysts expect National Bankshares to earn $2.56 per share in 2012 and $2.49 per share in 2013. In comparison National Bankshares earned $2.54/share in 2011. The bank has managed to maintain a high net interest margin of 4.00% – 4.80% since 2002. This period included an increase in Fed Funds rate from 2003 – 2007 followed by a decrease in Fed Funds rate from 2008 – 2009. Net interest margin is the difference between what the bank lends capital at, minus the cost of that capital. As interest rates are expected to remain low until 2014, the company’s cost of capital should be low. The level of profitability is especially noteworthy during current difficult economic environment. The bank is very conservatively run, which has resulted in a very low amount of non-performing assets of 1%. In addition, it has a solid balance sheet, with a tangible common equity of 12.50%, vs 7.50% for peers. This conservatively run bank would likely not be found on most investor’s radars.The Dodd-Frank act will likely have an impact on it, as it will have to increase overhead to comply with act and also face limitations on certain fees it can charge its customers. Another factor that would limit income growth is decrease in interest rates on the investment securities the bank owns in its investment portfolio, which account for approximately 33% of total assets. Only 27% of the company’s stock is held by institutions. This means that investors would not be competing with mutual funds for this stock. When few institutional investors are following a stock, there is an opportunity to uncover a good company and purchase it at a bargain price. 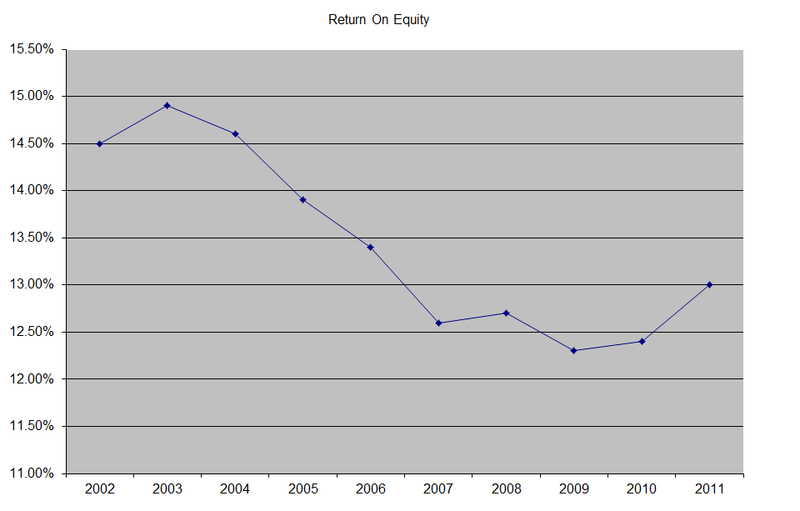 The return on equity has been declining since hitting a high of 15% in 2003, although it has been stabilizing since 2007 - 2008. Rather than focus on absolute values for this indicator, I generally want to see at least a stable return on equity over time. The annual dividend payment has increased by 8.20% per year over the past decade, which is higher than to the growth in EPS. The company pays semi-annual distributions to its shareholders. 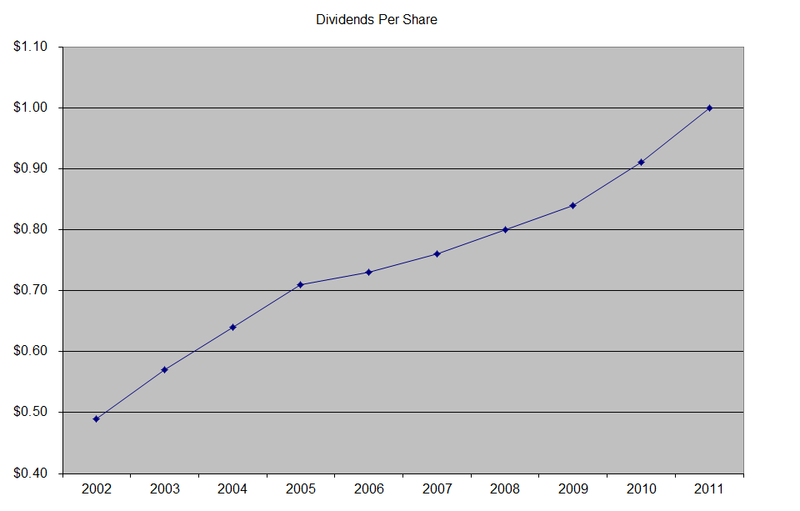 An 8% growth in distributions translates into the dividend payment doubling every nine years. The current semi-annual payment is twice the amount of dividends paid 9 years ago. 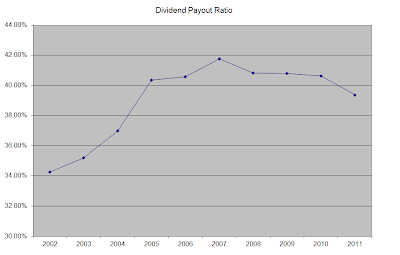 Between 2002 and 2004 the dividend payout ratio increased from 34% to 40%. Since 2005 however, this indicator has been flat around 40%. A lower payout is always a plus, since it leaves room for consistent dividend growth minimizing the impact of short-term fluctuations in earnings. Currently, National Bankshares is attractively valued at 11.50 times earnings, yields 3.50% and has an adequately covered dividend. I would consider initiating a position in the stock subject to availability of funds.